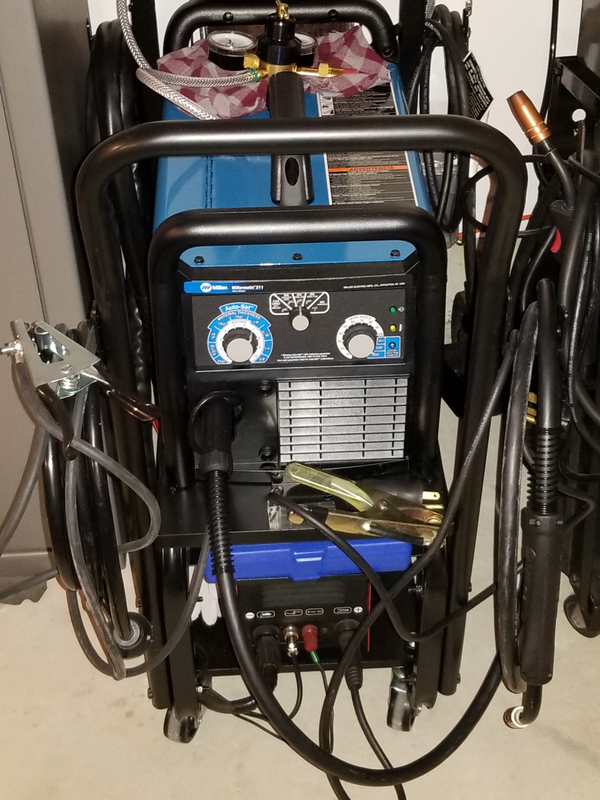 The Millermatic® 211 MIG welder with Advanced Auto-Set™ is a multi-voltage, 230 amp portable MIG welder that runs on both 120 volt and 240 volt input power. 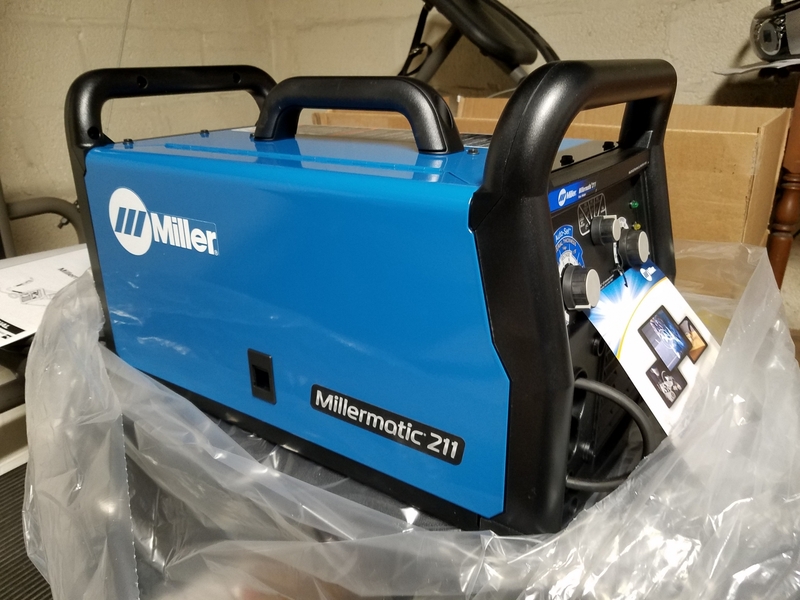 The inverter design of the Millermatic 211 means it draws less power, has a superior welding arc and weighs up to 40% less than other MIG welders in its class. The Millermatic 211 weighs only 38 pounds and is capable of MIG welding mild steel up to 3/8 inch thick. It features Advanced Auto-Set, which eliminates the guesswork of setting voltage and wire feed speed for your MIG welding application. Simply select the material thickness and wire diameter while the welder is in the Auto-Set mode, and you are ready to weld. The Advanced Auto-Set control automatically sets your welder to the proper parameters. It is available when welding mild steel, stainless steel or aluminum and can be used with solid MIG wire or flux-cored wire. Advanced Auto-Set also allows for the use of several different shielding gases, including CO2, Argon and Argon/CO2 C25 mix. Heavy-duty welder cart/cylinder rack is perfect for small Multimatic, Millermatic and Handler MIG welders and Diversion TIG welders. what size portable generator can i safely use with this welder? can the miller spoolmatic spool gun be hooked up to this machine? Miller Spoolmatic 30A Spoolgun 130831 will not hook up to a Millermatic 211 MIG Welder With Advanced Auto-Set 907614. Miller recommends either: The Miller Spoolmate 100 MIG Spoolgun 300371 is designed to run 4000 series aluminum (4043). The Miller Spoolmate 150 Spoolgun 301272 is a heavier duty design with a longer lead cable. It can run both 4000 and 5000 series aluminum. Millermatic 211 MIG Welder With Advanced Auto-Set 907614 will weld up to 1/8 aluminum on 120v and up to 3/8 on 230v both in a single pass. Can the regulator that comes with the MM 211 handle straight CO2 gas or does there need to be an adapter? The regulator that comes with the Millermatic 211 MIG Welder With Advanced Auto-Set 907614 will not hook up to a Co2 cylinder without an adapter. What is the 220 volt amperage draw when welding 1/4” thick steel. I have a 5,000 watt generator that is not pure sine wave. Millermatic 211 MIG Welder With Advanced Auto-Set 907614 draws 4.0 kva on 230v and 16.6 amps. Can it do stainless as well? Millermatic 211 MIG Welder With Advanced Auto-Set 907614 can mig weld stainless. To flux core weld, does the polarity need to be changed by swapping out the cables inside the machine, or do you just have to use the setting switch on the front of the machine to change the polarity? Thanks. Millermatic 211 MIG Welder With Advanced Auto-Set 907614 polarity would need to be switched inside the machine to weld with flux cored. What is the aluminum thickness range that this welder can handle in both 120V and 240V with the Spoolmate 150 spool gun? Thanks. Millermatic 211 MIG Welder With Advanced Auto-Set 907614 will weld up to 1/8 aluminum on 120v and up to 3/8 on 230v both in a single pass. Whats the difference between 907614 and the 907612 millermatic 211? Is a tig accessory available for this unit? No, the Millermatic 211 can not be used for TIG welding. Hello, what comes with spool guns, 300371, 301272? Do I need to buy a regulator? And what is the main difference between the two? Thanks. Miller Spoolmate 100 MIG Spoolgun 300371: Comes Complete With 12 ft. (3.7m) cable Custom carrying case Extra contact tips and nozzle The Spoolmate 100 is intended for Home/Hobbyist use ONLY - not production welding. Cyberweld does not recommend the Spoolmate™ 100 for aluminum MIG wires larger than .030 diameter when using a Millermatic� 140 MIG welder. Miller Spoolmate 150 Spoolgun 301272: Comes Complete With 20 ft. (6.1m) cable Extra contact tips and nozzle NOT suitable for use with .023 diameter welding wire. the 150 has 20 foot cable instead of 12, 150 amps @ 60% duty cycle instead of 130 amps at 30% - about the ONLY thing the 100 can do better is run .023 hard wire. The price shown on our website does not include the rebate. The $1,079 is the price that you would pay on and once you file your Miller Build with Blue Rebate they will mail you a check for $100.00- therefore making the total price out of pocket $979. The Millermatic 211 is capable of running .023 and .024 welding wire. No, to weld aluminum with a Millermatic 211 MIG Welder With Advanced Auto-Set 907614 you will need to purchase a Miller Spoolmate 100 MIG Spoolgun 300371 or a Miller Spoolmate 150 Spoolgun 301272. You will also need a spool of aluminum filler wire and a cylinder of 100% argon gas. If a warranty claim is needed, how is that handled? Through you? Directly with Miller? Local Miller rep? If warranty work is needed, you will first contact Miller Technical Support and troubleshoot to see if the issue can easily be resolved. If you cannot find a resolution over the phone, your machine can be brought to one of the many Miller repair shops within the United States and repaired. If anything further is needed, you will want to contact Miller directly and go from there. Is this machine works even without gas? The Millermatic 211 can be used without a shielding gas if used with Flux Cored welding wire. WHAT SIZE GENERATOR WOULD I NEED TO USE THE MILLERMATIC 907614? The Millermatic 211 would require a generator that can constantly run 4000 Watts. 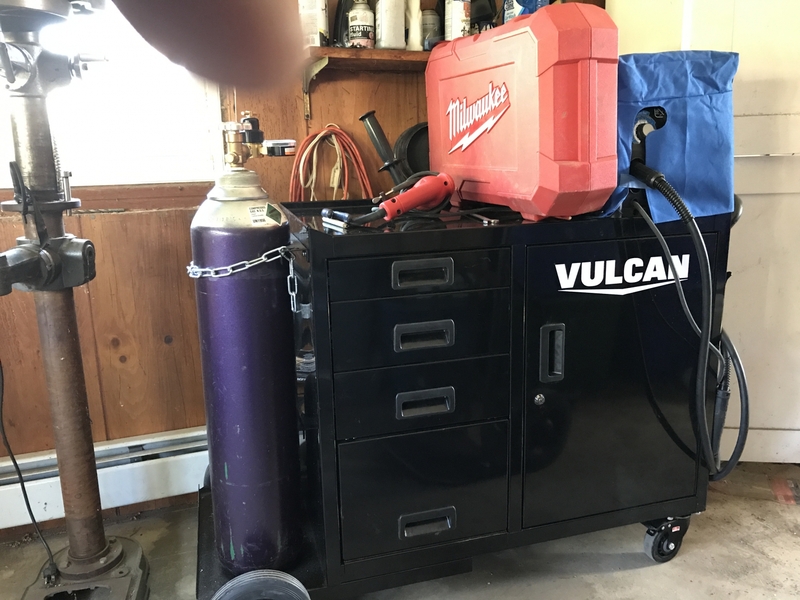 How much is it to change my millermatic 211 to a 230 volt mig welder? The Millermatic 211 MIG Welder With Advanced Auto-Set 907614 can be changed to a 230 volt machine by just changing the MVP plugs of the power cable. We do offer a Miller MVP Adapter Plug - 230 Volt/50 Amp - 219258 on our site for $19.91. I need replacement torch you have part number? Where does the Machine ship From ?? Will the 211 weld TIG with a kit?? 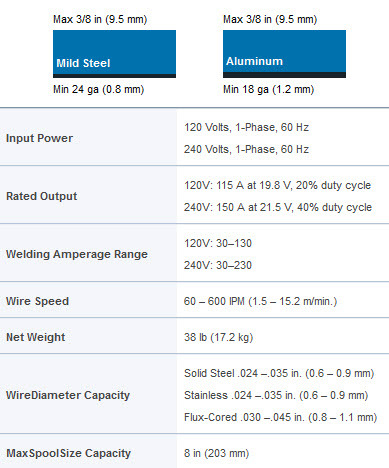 can you weld aluminum with the millermatic 211 mig welder with advanced auto-set 907614 and if so is there anything extra i need to buy to weld aluminum with for this welder? Many manufacturers will substitute metal parts for plastic to be able To sale to the big chain store such as Lowes. I know this to be true With plumbing fixtures and appliances and even welders. What quality Equipment are you selling? Can this machine be set up for silicon bronze? And if so what is required? Can you explain the $1099.00 Cyberweld price? Is this the price before the $100.00 rebate? After the $100.00 rebate? Can you explain what the other possible $200.00 rebates are? 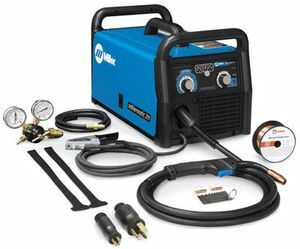 Thanks Cyberweld Price: $1,099.00 Mfg Industrial Price: $1,469.00 You Save: $370.00 Get a $100 mail-in, cash back Build With Blue™ rebate from Miller with the purchase of a Millermatic� 211 MIG welder. Earn up to $200 MORE in rebates when you purchase additional Miller or Hobart branded products. Rebate form included with order. Additional products must be purchased on the same order as welder. Expires 12/31/16. Hello good day! Does P.R send? and what would be the cost of shipping? We do not ship directly to Puerto Rico we work though an exporter. To determine your cost to ship a Millermatic 211 MIG Welder With Advanced Auto-Set 907614 to Puerto Rico you will need to place an order thru our web site. You will reach a point in the order that requires your shipping information.Once you provide your shipping information the exporter will automatically take over and will provide you with your shipping costs. At this point you can continue with your order or you can opt out of the order. i purchased a millematic211 on 6/13 but i am unable to find a away to redeem my $100 mail in rebate from miller. How do i do it? I have a miller 211 and love it. I Want to be portable though without the use of a large generator welder. My question is how many watt generator should I buy to comfortably run this machine on either 110 or 220? I know some generators have a different working watt than the machine actually says. Thanks in advance! What are the recommended power requirements? What type of receptacle is needed? What is the NEMA configuration of the receptacle? It looks like a 6-50R. Our price for the Millermatic 211 MIG Welder With Advanced Auto-Set 907614 is $1099.00. Once you receive your 211 you file a rebate form with Miller and Miller will send you your rebate amount. The Cyberweld price for the Millermatic 211 MIG Welder With Advanced Auto-Set 907614 is $1099.00. To get the $100.00 rebate you have to electronically file a rebate form with Miller and Miller wil thenl send you a check for $100.00.We offer free shipping to all states except Alaska and Hawaii. Can 10 # rolls of wire be used with the Millermatic 211 with Advanced Auto-Set? You can uses 10lb (8" diameter ) spools of wire in the Millermatic 211 MIG Welder With Advanced Auto-Set 907614. Is there supposed to be a delay on the drive roller mechanism? If I set the wire feed speed to max and pull the trigger it will roll slow for about 3-4 seconds and then the speed will increase. It even does this with no load on the drive rollers. The Millermatic 211 MIG Welder With Advanced Auto-Set 907614 is designed to do this . It is called wire run in. As soon as an arc is initiated the wire will automatically go to the wire preset wire feed speed. Can the 211 be ordered with a longer feed / hose for the gun? The Millermatic 211 MIG Welder With Advanced Auto-Set 907614 cannot be ordered with a longer mig gun. A longer mig gun can be purchased separately and added. Can I use flux cored wire on Autoset? 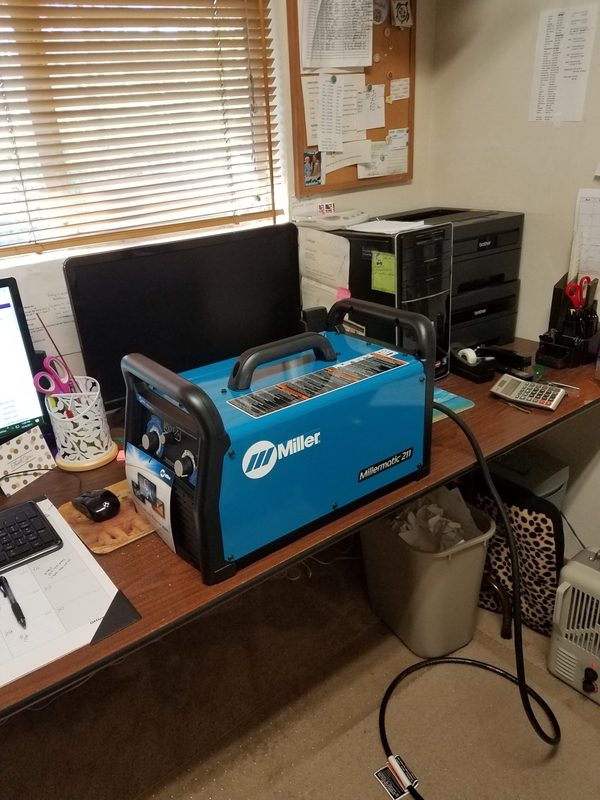 When you receive your Millermatic 211 MIG Welder With Advanced Auto-Set 907614 you will receive a copy of your receipt and instructions on how to submit your rebate request to Miller electronically through their web site. (MillerWelds>com/buildwithblue. The rebate must be filed on line. I have a coupon from Miller for $100 Will that come off of the $1099 price? THanks Ready to order. We are not aware of any coupon program through Miller. Possibly this is through Miller sales directly. Currently we are participating in The Miller Build With Blue Program for the Millermatic 211 MIG Welder With Advanced Auto-Set 907614. Through this program Miller will refund a $100 to you after you have purchased the Millermatic 211and then completed and filed the rebate form electronically. What is a good time to buy the Millermatic 211 with cart at the best price that includes a mail in rebate from Miller? At 120 volts what is the amp draw. Will it work on a 20 amp circuit. The Millermatic 211 MIG Welder With Advanced Auto-Set 907614 will draw 24.3 amps at the rated output of 115 amps. If you run the unit below 115 amps it should run on a 20 amps circuit. Is there any current rebates or freebies with this welder? How much time to ship to ( San Diego ) What's the total amount with tax included ? 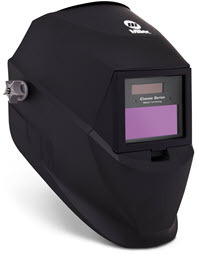 Currently there is no rebate or free helmet program for the Millermatic 211 MIG Welder With Advanced Auto-Set 907614. These programs ended on December 31 2015. Can I know the exact dimension of the shipping packaging? The shipping carton dimensions for the Millermatic 211 MIG Welder With Advanced Auto-Set 907614 are 21" x 13" X11" it weighs 50lbs. The Millermatic 211 MIG Welder With Advanced Auto-Set 907614 comes with the #261157 three groove drive roll. This drive roll will run .023/.024 solid wire, .030/.035 solid wire and .030/035 flux cored wire.We offer cylinders for shielding gas that range from 20 cu ft to 80 cu ft. Does the Miller 211 currently qualify for any rebates? 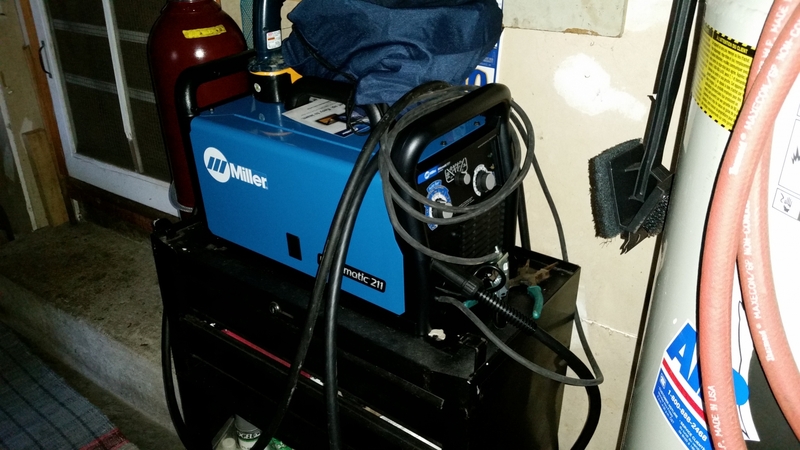 The Millermatic 211 MIG Welder With Advanced Auto-Set 907614 comes complete and ready to use .. 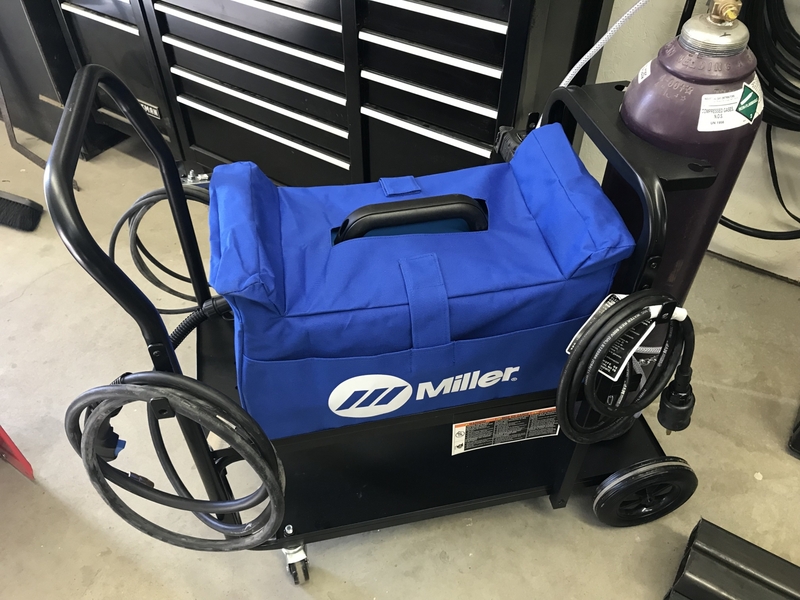 If you want to purchase a Millermatic 211 with a cart you can purchase the Millermatic 211 MIG Welder With Advanced Auto-Set And Cart 951603 . If you plan to weld aluminum you will need a spoolgun. You can purchase the Miller Spoolmate 100 MIG Spoolgun 300371 or if you want a heavier duty spoolgun you can order the Miller Spoolmate 150 Spoolgun 301272.We offer the following wire for welding steel using a argon/ co2 shielding gas mixture.Hobart E70S-6 MIG Welding Wire - 2# Spool H305401-R19 or Harris E70S-6 MIG Welding Wire - 11# Spool. These wires are available is .023,.030, and .035 wire sizes.. The size you will need will be dependent on the thickness of material you will be welding. The .030 is a good average choice. 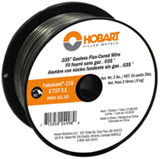 If you plan on welding steel with out using a shielding gas you can purchase Hobart E71T-11 Gasless Welding Wire - 2# Spool H222106-R19 or Hobart E71T-11 Gasless Welding Wire - 10# Spool H222106-R22. These wires are available in sizes .030 and .035. For welding aluminum you will need to know the alloy of the base material you will be welding.. We offer 2 alloys of aluminum wire 4043 and 5356. If you need 4043 wire you can purchase Harris 4043 Aluminum MIG Welding Wire - 1# spool which is available in .030,.035,and 3/64 wire sizes. If you need 5356 wire you can purchase Harris 5356 Aluminum MIG Welding Wire - 1# spool which is also available in .030,.035, and 3/64 wire sizes. Great little welder ....would buy again! ConsCheap ground clamp! Could of been boxed better for shipping ...welder door received little dent in shipping ....wasn't big deal! This welder has a smooth arc with the settings for the novice, but if your a pro (or think your a pro like us here at the shop) if you fine tune the adjustments for the material and thickness it is probably one of the smoother welders a I have used, and we have a wide variety of different name brand machines. Works great and easy set up. If I need another one, this is the one I would order. Gotta say, it's pretty awesome. Super lightweight. Autoset features work awesome. Everything seems great about it. Easy to weld with right out of the box. I actually purchased this for a friend for his 70th birthday. I have not used the machine but believe he is happy with it. Will do all he needs it to do. The ordering and purchase was real easy and the people on phone were really nice and helpful answering my questions. Shipping was fast and on time with no damage. As far as performance I cannot comment on that yet..
this is my 2nd welder. the Autoset feature makes most jobs quicker & trouble free. Have not needed to use the 110 volt option yet, but I will now be able to use this unit as a portable welder for small jobs. We live in a rural area so having the Miller name /reputation was important to me. We are just too far from any welding product dealers too be able to count on them for assistance. Only used on 110v so far. Need to change my 220v outlet from 4 lug. Handles 3/16" on 110v no problem. As I have read in other reviews and seen on video reviews, the Auto-set is a little hot. Welds much better with manual settings. Smooth Start is hard for me to get used to. Would give 5 stars if I had a way to turn off Smooth Start. Can't find a way in the manual or on website. Maybe not looking in right place. ProsLight and Portable. Makes nice weld after dialed in. Easy to set up. Holds 12 lb. Wire roll. ConsSMOOTH START. Ground clamp seems cheap for Miller product. Item arrived promptly and does everything advertised. I love its portability. Conswould like a 'hold down' as part of the welder to ensure stability on my role around. Received my welder fast & already started welding up my own cart. The Auto Set seems a little hot but this is the first time I'm using flux core so that may just be the process. I have only used it on 120v so far, it seems up to the task. Super high quality unit and all of the components. ProsWorks perfectly, looks great, perfect size for storage. Made by a great company that will be around for years to come so service parts, if needed, will be available. Unit welds perfectly and extremely easy to use. ConsCannot come up with anything! Great welder for home and farm use. Portable and dual voltage. Cyber weld fast shipping and great service. If you are looking for a compact Mig welder , don't let the small size of the 211 discourage you. It has a very stable arc, and will do the job on steel 3/8 and less. ProsSurprising powerful with stable arc. ConsMig gun it comes with is a little flimsy for metal thicknesses above 3/16. Go ahead and upgrade to the Bernard Q150 for less than $200 from Cyberweld. It's comes with the Miller end is a direct plug in for the 211 machine. This welder is a monster!. I don't know how i lived with out it for so long. ProsWelds beautiful, small easy set up. I've only used this machine twice since I bought it several weeks ago - once to test the parameters and the second time, in a field application. I wanted this machine as a supplement to my Bobcat 250 engine-driven welder without the extra cost of a suitcase welder. I'm using .035 dual shield flux core wire with C25 shielding gas, and so far, I've had no problems. It feeds smoothly and the welds look great. Because of the unique composition of dual shield flux core wire, the slag usually peels off on its own, or with the light tapping of a chipping hammer. ConsGas hose should be longer. I love the ability to dial in the energy and wire feed that I need for the particular job. I am glad I bought this welder. ConsThe only issue I have is that the on/of switch is on the back of the machine. I am in a wheelchair so when I'm set up to weld, I have to move around the machine to turn it on or off, and if I'm in a confined space, it can be problematic. My suggestion is to move the on/of switch to the front of the machine. I have been booger welding with a big box 120V flux core unit for the last several years. Flux core welds are ugly no matter what & I was getting laughed at regularly by friends & expierenced fabricators for even bothering with flux core. Welding 1/4 thick material with a 120V flux welder is torture. Until recently my projects only occasionally required welding & I avoided it if possible. I just assumed the double ugly welds were due to lack of practice & I was probably just terrible. Welding needs changed recently & I decided to pull the trigger on the 211 after reading 3 or 4 solid reviews here. It changed everything for me instantly. After pulling a 30A 240V circuit across the shop & about an hour of practice I was laying beads like a boss. I'm far from a pro but my welds now look as good or better than the dudes that used to point & laugh. Duty cycle is on the low end & the auto set feature is just ok. I also swapped out the baby ground clamp for something less puny. If you're on the fence about stepping up to a 240V unit the 211 is what you're after. Welds like a pro. Easy to set up and use. As a "hobby" welder at best, I sought the advice of a father/son welding shop that I have known and trusted for years. Millermatic was the first word from both of them and I can see why. Great machine, easy for me to set for material thickness and weld without second guessing myself. No learning curve = no wasted time and materials trying to dial in settings! Should have purchased one years ago. ProsLightweight, easy set up, dual voltage. Great value on an versatile machine! ProsAll around great welder, optional spoolgun is head and shoulders above the competition! I'm a beginner welder, so was looking for something automatic (and forgiving). The 211 doesn't disappoint. Today I fired it up for the first time, on auto, unshielded, on some scrap metal I have in the garage. Works as expected. Looking forward to learning. My unit arrived in good shape through USPS to Hawaii as well as the helmet which was in a separate box. The 211 is a great machine and the 120/240 flexibility is awesome. I would recommend this unit for portability and ease of use. Thanks Cyberweld for having the best price! Haven't had long but performs well as expected. First of all, shipping is free. Uhhhh... hell yeah! Ordered the machine on a Friday, midday. Welder arrived at my front door Saturday late afternoon. Packing was great, everything arrived unscathed. And a free welding helmet..
You go Cyberweld, you go! First off I'm not a professional welder but I have done some welding and this machine is the best, easy to use, lightweight I can pick it up carry it around put it in the back of my truck, car, without straining, the dials are easy to use Simple to operate for the beginner or the expert looking for a dual voltage machine, easy to set up right out of the box. Miller did their homework when they built this machine, you will not find a better machine made on the market, hands down ....would buy a thousand of them if I need them, hats off to you Miller. ProsLightweight, easy to use, easy to read manuel . ConsNeed to buy fluxcore wire if not using gas. Welder arrived packaged well and everything was in good shape. I am very satisfied with the product and the fast shipping. I ended up buying some gloves and welding jacket from them as well. I purchased this for my son and he is absolutely happy with it. Uses it often. Quick delivery and great communication! Thanks! My order came in on time, no delays. They had a great deal in which why I chose to go with Cyberweld. I will definitely use them again in my next welder and accessories purchase. The settings work perfectly. High quality as always from Miller. Makes you a better welder for sure. Let me give you a little back story, I am not a welder by trade. I am actually a certified electrician, I have never welded anything other than some tack welds for automotive body work. I am currently up grading my Jeep TJ with a Dana 60 front and Sterling 10.5 rear. So to keep the cost down I figured to weld the trusses my self. I don't have welding experience so youtube will be my teacher. So far after using the Miller 211 in automatic mode, it has made the job of learning how to weld so much easier. I don't have to worry about the settings on the welder, I can concentrate on getting my welds to look good "not easy to do". This is the perfect welder if you are a novice, like me. ConsPrice, kind of expensive for a hobbyist. "You get what you pay for". Just bought one, and it came with the Miller helmet. Both work great. Great little machine! Comes with most of what you need to get started. It comes with a spool of solid .30 wire, so you will need to ether buy a spool of flux core, or a bottle of 75/25 to start welding. The operation of the welder is clean and smooth - this depends a little on the operator though, as with any welder. Will weld up to 3/8" with 220v, so you will have no problem with most all automotive work and then some. This is a five star welder, makes welding an easy task. This machine has performed very well so far. I really like the 110/220 option, but so far have only used 110 and it's done everything I've needed, mostly 3/16 crs. Cyberweld was great to deal with and shipping was quick. ProsPlenty of power, small easy to move around in my shop. Fast Ship & Great quality!! I purchased this 211 to have both 120/220v inputs, as well as the small size so I can take it mobile on jobs. I am very happy with it so far (first week). the auto set feature seems to be a good feature, though I feel I can tune it a little better. it seems to have plenty of power. I will say the compact whip will come in handy for its intended purpose, though I can see it being a little under rated for higher amperage continuous duty (it is mated perfect to machine's duty cycle though). I admit I have been a little leary of miller products for the past 10 years. this seems like a great welder though. Proscompact, great arc and feed. Consground clamp is a little cheap, but its all you need for the rated output of this machine. Received it and it works really great. I am so happy with this welder. It's my first welder, I am so glad I chose the Millermatic 211 It almost does the work by itself. Great deal, quick delivery and free helmet. Who could ask for more? Everything promised was delivered and in great time. Zero complaints! Welding with this machine has made welding a joy and dealing with Cyberweld was easy and worry free. Will use them for all my welding needs from now on. I'm very happy with the miller 211.. its a great machine. Cyberweld has great customer service, and fast shipping. I am a very satisfied customer. This welder is amazing. I have used many Miller welders in my time and this one beats them all for a 110/240 combo. My only complaint is the ground clamp. It could be more heavy duty. The whole welder otherwise is top notch. This is a great little welder for what I do. Super deal, thank you for making it available! Polite, fast shipping and they did everything they said they would. After searching local welding supply shops and online, I went with Cyberweld for the price. The free shipping was also a big plus. It works great. ProsPrice, shipping, and rapid delivery. After many years trying to weld with cheap junk welders, I was starting to think that I just couldn't weld. So I did my research and bought this. It seemed to be the best that I could buy for my application. Set it up, did NOT practice, went right to my race car and laid 8 perfect beads welding a bumper bracket to the car. I still cant believe how good it works. Prosworks great, easy set up, very small and light for its capabilities, portable. very high quality. 110 or 220v. ConsA little pricey, but worth it. What a great machine. I've done anything from 1/2" plate to 22 gauge sheet metal, and really don't have much welding experience, but this machine makes it easy. I ordered it on a Thursday night and received it Saturday. It came with a Jackson Insight helmet which I absolutely love too. I've been looking for a nice portable welder for awhile. I've been welding with different Miller machines but when I want to do a side project at someone's house the welders I have are too large to load up to the truck. This welder is GREAT ! I used it with a 40 ft extension cord welding .060 gauge tubing and did it no problem. This welder also came with a free Jackson welding helmet. The head straps are comfortable and a nice size visibility window. 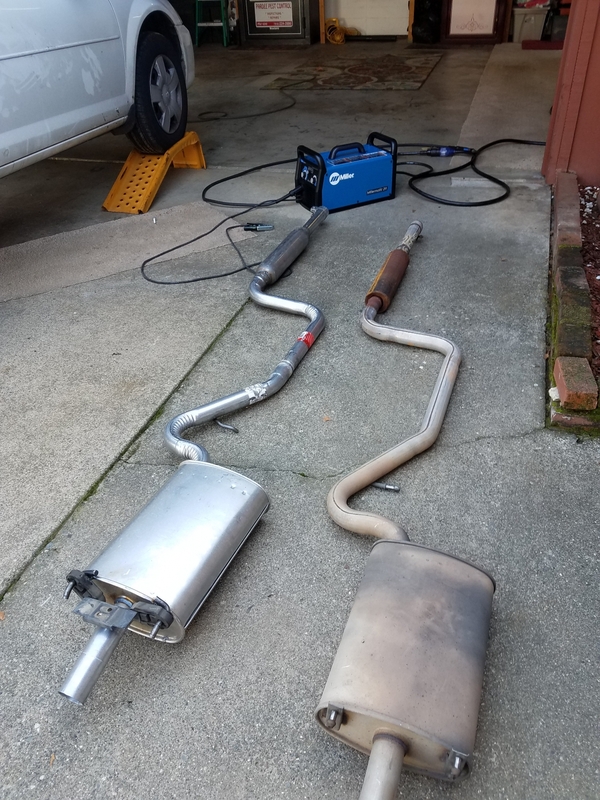 First purchase with Cyberweld and will not be the last. Great people to deal with. ProsCan use 110v or 220v Lightweight !!! I bought this welder over the Hobart believing that the Miller was better quality. A couple of months later of welding a project on the weekends I am dead in the water because the gun has gone bad and the trigger wiring will no longer work. Ironically, I had to borrow my friend's Hobart to finish my project while I wait for a servicer to test and replace the gun. A Great Little Welder ! I like the idea of having it dual voltage. That makes it very convenient, for where ever you are. I also own a 300 amp wire feed MIG, and for most jobs to 1/4", it does just as good ! Big Blue comes through again ! ProsSmall enough to be portable. Large enough to "Burn it in". ConsCant really think of any. Great welder, just like all Miller products. The weight of this machine makes it extremely portable and easy to move. Good power across the entire spectrum. This Miller Welder preforms as well as I expected. Great machine! My second miller welder, would not have any other brand. best wire welder I ever used, simple, powerful, and light!